It is such an honor to be featured in the current issue of Mary Engelbreit's inspirational magazine. 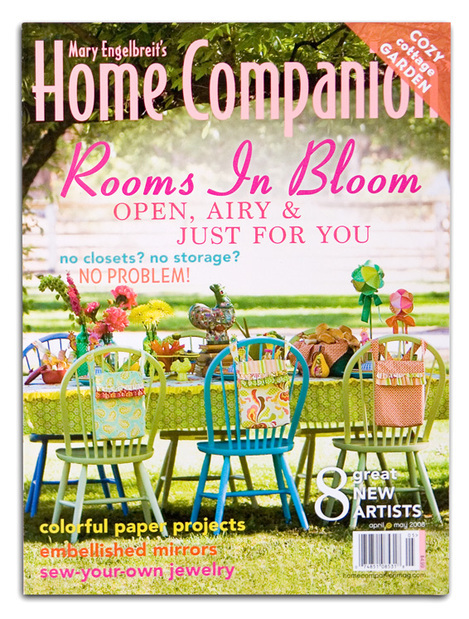 I don't have many magazine subscriptions & Home Companion is right there at the top of my personal favorites. If you haven't thumbed through this magazine before, go get yourself a copy! Exciting artists & designers, beautiful homes, nifty projects... the works. Of course, if you've clicked on over to this page, you probably have a copy of the magazine already clutched in your arms & are looking for more info about the projects and materials featured in the cover story of the April/May 2008 issue. 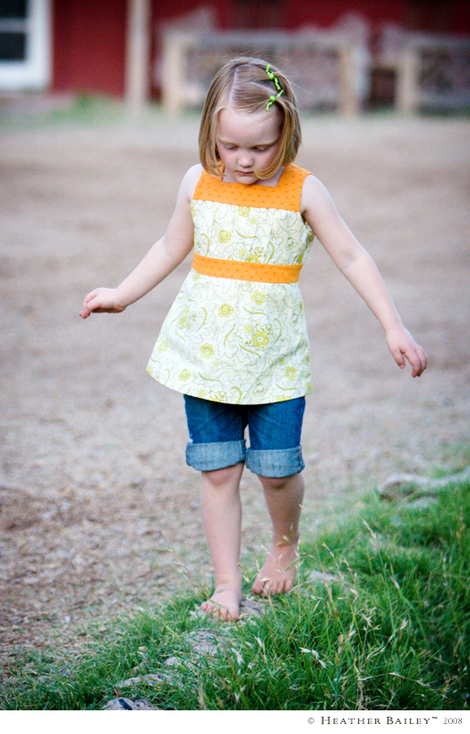 First off, there are two free patterns from the article available for download. Both are paper craft projects. 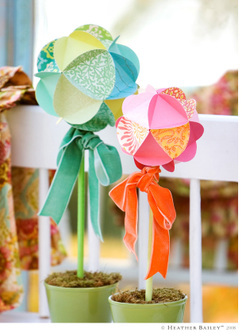 The first is my Paper Globe pattern, with instructions for creating topiaries from these easy paper balls. They make great ornaments too. 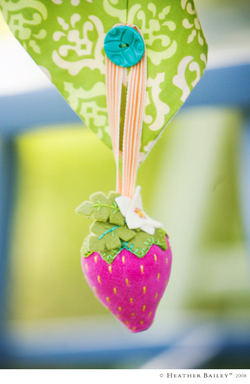 For the pattern, click on the "Paper Globe" Link in the sidebar of my blog under "Free Patterns." 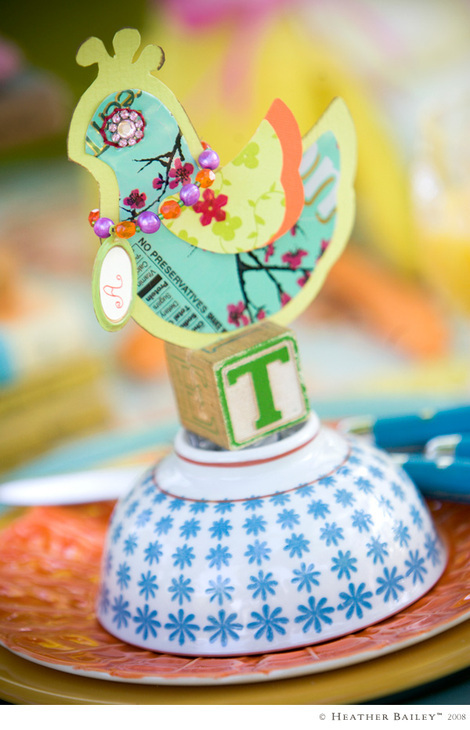 Then there's the Party Chicks pattern, which can be used to make placecard holders for your next Spring party. Or use the pattern for a present tag or notecard. 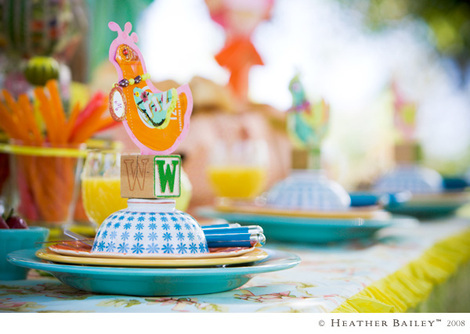 The Party Chicks in the article were made with a combination of craft papers & soda-can tin. No trick there, just cut the side off a soda can with junk scissors (not the good ones! ), flatten it out & use in place of paper. A glue stick did the trick for me. Tin sheeting can make a mean paper cut though, so use paper if you're crafting with young kids, use common sense, etc. Find the Party Chicks pattern link in my sidebar as well, under "Free Patterns." Then there's all of the sewing fun! All of the projects featured in the article are made from my Freshcut™ fabric collection, available wholesale through Westminster/Free Spirit and retail through hundreds of independent fabric shops worldwide. This article is the first official preview of my upcoming sewing pattern collection set to launch this Spring/Summer 2008! Of course, there are some upcoming patterns not shown in the article (aprons, quilts, purses, etc. ), but most of the sewn designs from the article will be available for purchase as sewing patterns in the near future. One of the first patterns will feature my pear pincushion, as well as the strawberry pattern at right (used as a tablecloth weight in the article) & a couple of other pincushion designs. The bookbag design, and the pig & chick dolls will be published as patterns as well. As it's made, I'll announce news about the patterns on my weblog, HELLOmynameisHeather.com, so stop back by. And we're moving right along on those patterns! Now that my scrapbook & paper craft collection is designed and onto production, we're busy behind-the-scenes finishing up the first wave of sewing patterns, my next collection of fabric, two or three other "secret" projects, and we're wrapping up the design of my new site at www.HeatherBailey.com. Speaking of Isaac (the other half of "we"), I owe my husband a big thank you! 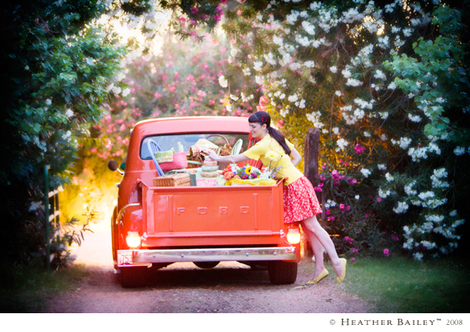 He did all of the beautiful photography for this article and is a great help in so many ways. Thanks, hon. And big hugs to my friends and their lovely daughters: Mimi, Katie, Kaitlyn & Abby. For sewing help (I couldn't have pulled this off without you), a huge thank you to my friend, Jona, & to my mom, both amazing seamstresses! Finally, to the editorial staff (especially Kathy & Barbara! ), thank you for this opportunity. I absolutely adore Home Companion. It's a complete honor to have worked with you. Keep the inspiration coming! Thanks for stopping by, everyone. Send me an email if you have any further questions! Oh yes, and Abby and I are wearing Trash Ties™, my hair accessory invention thingie. 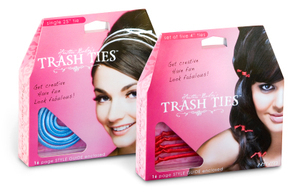 To learn more about Trash Ties & what they can do, visit TrashTies.com! Here's my blog post explaining the whole sh-bang.